This week is all about looking good and feeling good. Sometimes being a mom means that there is less time for you and more time for everyone else. It’s very easy for a mom to fall in a style rut simply because she is too tired and/or just doesn’t have the time to be sitting in front of the mirror for over an hour every day. A full wardrobe update may not be realistic but you can always make little changes like trying something new with your hair. In our previous article about revamping your style, Raquel mentioned switching up the look of your hair. 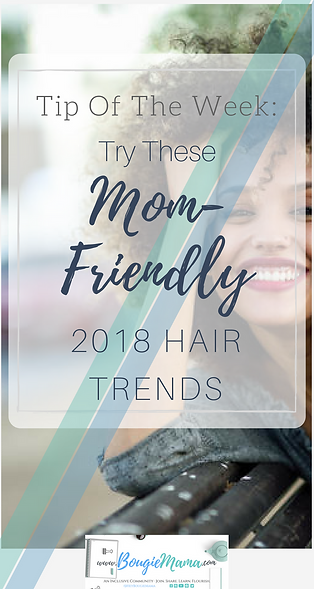 So I took the time to comb through all the current hair trends and hand-picked the ones that easily fit into the life of a mom. See which ones you want to try out today! 1. Let the curls free! (This is sad to say, but..) Yes, the way your hair naturally grows out of your head is now a trend. [insert dramatic eye roll] It’s crazy to think about how many years I spent straightening my hair because my curls weren’t accepted by society like straight hair was. But that’s a topic for a whole ‘nother article. Depending on your curl pattern, wearing your curls out in a look like a wash-and-go can be either a lot of work or the easiest and quickest option for you. Spend less time fighting your hair and just let it do what it wants, and rock it! Wearing head wraps and scarves is also another thing that has already been happening in communities of color, but the majority of society is just now getting hip to it and accepting it as a trend. Even if you have been wearing headscarves and wraps for years, you can always switch it up and try different ways to wear the scarf that you don’t normally do. I am huge on the turban wrap right now. It’s so easy and perfect for those days when I just don’t feel like doing my hair. The trend on the runways right now is wearing a headscarf “granny style” like they did in the 40’s and 60’s. You can add a fashionable twist by using scarves with modern colors & patterns or keep it retro. 3. Do a messy braid or two. I love this trend for moms because it’s so practical! Half the time when I put a braid in my hair it turns out messy anyways after 10 minutes of wrestling with my two little boys. You can try out a loose braid or 1 or 2 dutch braids. You can also wear your down and just quickly throw in a few random messy braids if you don’t want all of your hair pulled back. If your hair is curly, you can simply stretch your curls out after a wash, then braid it after it’s about 90% dry. If your hair isn’t real long you can always use weave to achieve the look you want. A hairstyle like a bob is great for moms because there’s a lot less maintenance involved than there is with longer hair. What I love about the fringe bob versus a traditional clean-cut bob is that it’s very curl-friendly. It’s hard to get a clean straight cut on curly hair without straightening it all the way out and blunt cuts just don’t mesh well with curly hair. The uneven-ness of fringes is perfect for curlies to wear a bob in their natural state without feeling like they have to straighten their hair. If you don’t want to commit to cutting your hair, you can always fake a bob by tucking and pinning your ends or test the haircut out with a wig instead. Raise your hand if you absolutely adored Jasmine’s ponytail from Aladdin when you were little! The little girl in me is so happy about this trend because it’s super fun and nostalgic for the 90’s. This is for some of us who like to have a little fun with our style. This trend is also very quick and easy to do. And let’s face it, half of us are throwing our hair into ponytails every day anyway. Why not give it a little colorful twist with some cute hair bands or just by tying a string around. This style can also help to keep your hair from getting tangly throughout the day and protect your ends (if you tuck them) from getting dry. Fashionable and protective. Win-win! Those were 5 hair trends easy and practical enough for any mom to try today! Which one is your favorite? If you try any of these out, post a pic on social media and tag us @heybougiemama so we can see! We’d love to repost some of your looks on our Instagram! Download this Daily Checklist for Mama Entrepreneurs!